Do you love nature and enjoy camping? There is just one tiny problem that might squash good time – the mosquitos! 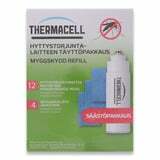 Here is Lamnia's solution: Mosquito Magnet traps and ThermaCELL repellents.